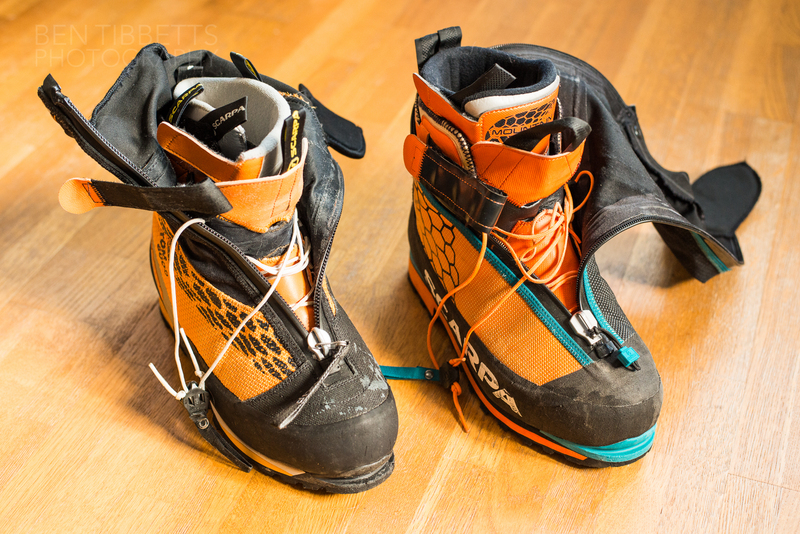 This is a review of a pair of pre-production samples of next seasons Scarpa Phantom 6000 mountaineering boot. I’ll say straight up that I don’t know much about boots except than how to use them. 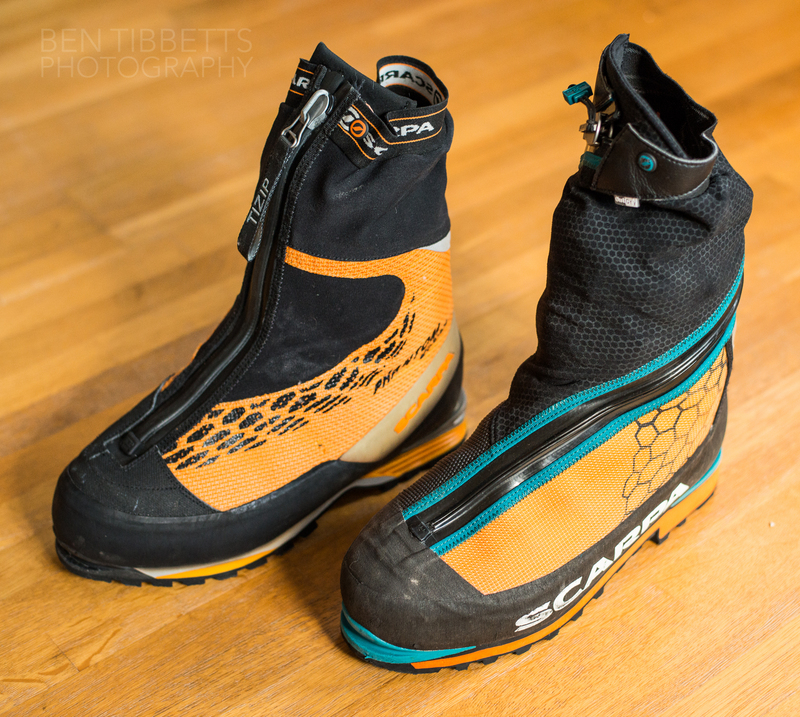 Secondly I work with Scarpa (France) as an ‘ambassador’ and photographer, hence I was given these boots to test out on an expedition to Kyrgyzstan that I was guiding back in September for ISM. I will try and provide mostly facts and images so you can draw your own conclusions. Feelings are pretty subjective anyway. 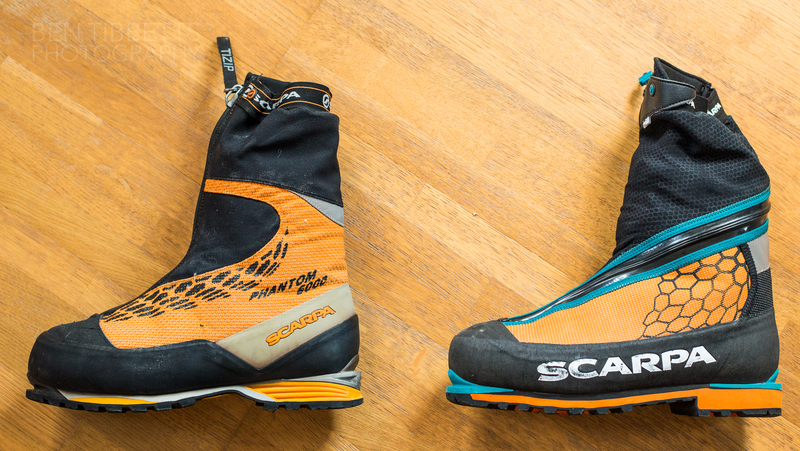 I am going to compare these boot with the nearest boot on the market – their predecessor, the current Phantom 6000. 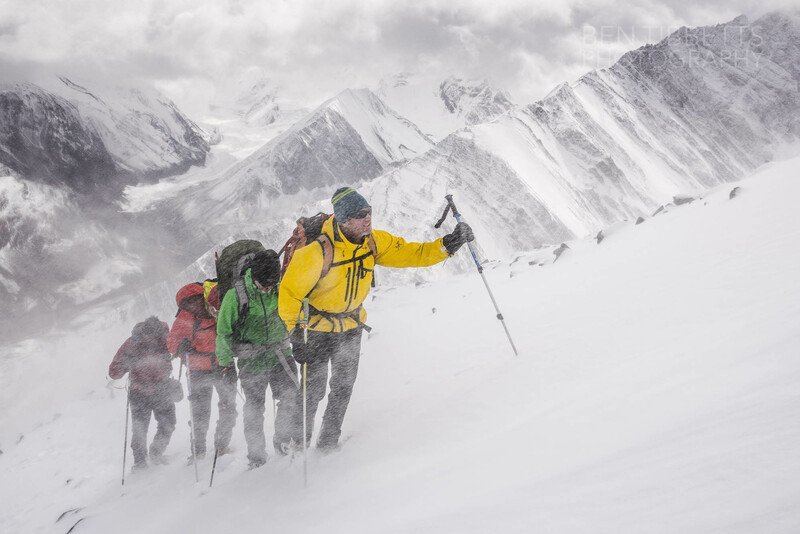 4500m on a new summit in the Kyrgyz Zaalay range. Adrian Nelhams (IFMGA, ISM Director) and clients in pretty gnarly conditions! Since getting these boots in August I have used them for about 30 days. 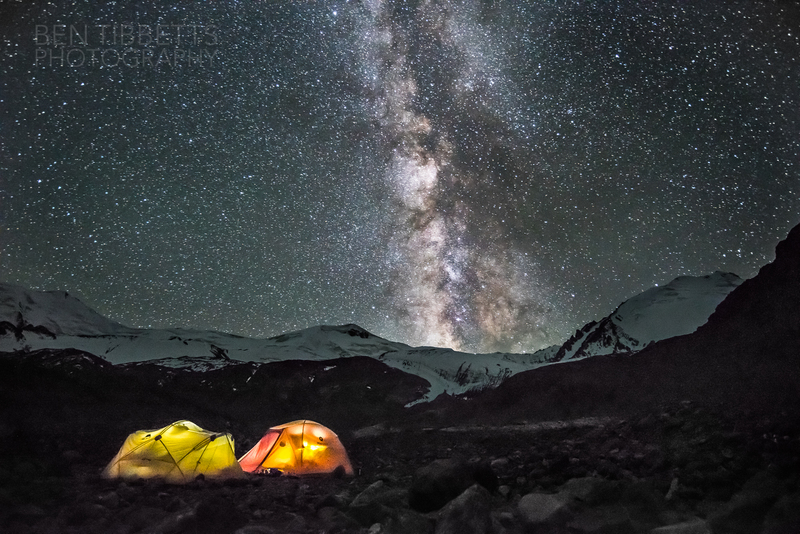 Most of this was in Kyrgyzstan Pamirs between 3500m and 5500m. The terrain was mostly sharp sandstone and limestone moraine, snow and ice slopes with broken rock ridges. They have also had a bit of use in Chamonix this autumn. The boots are photographed as such with about 30 days wear in unforgiving abrasive terrain. The first thing one notices is a style makeover, and that the sturdy Tizip running straight up has been replaced by a lighter but longer YKK zip that winds its way round the outside of the foot to terminate inside the ankle. The idea behind this is to avoid the pressure point created where the old Tizip creased at the ankle joint. In this respect it worked fine and didn’t create any pressure on the front of ankle, though I had never really noticed it as a problem before. If anything it feels as though one has more flexibility to rotate and bend the ankle in any direction. On the flip side I don’t think I have ever re-lubricated the Tizip on my Phantom Guides that are 5 years old, yet the new YKK felt like it needed some lubrication after a couple of weeks use. The teeth are not as deep and hold less lubricating goo in I guess. Both the sole and midsole unit have changed quite a bit. The new midsole seems to be a lower density construction, and likewise some of the sole is a soft orange rubber that seems light/lower density. The tall wraparound rand also seems to be a thinner rubber. Likewise the heavyweight crampon patch on the instep has gone, and all the upper fabrics seem a bit lighter. Most of the instep is now a light fabric (lined, like the rest of the boot with “OutDry” waterproof membrane) that has small plastic abrasion resistant bobbles. 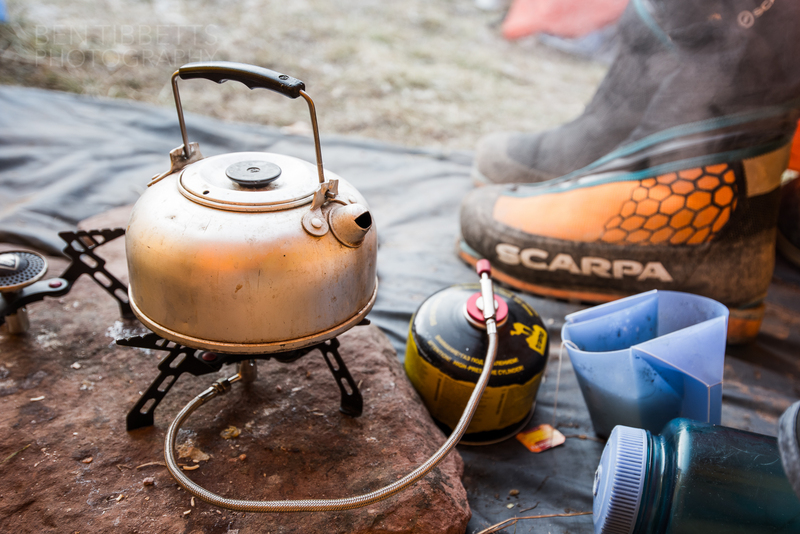 Needless to say when arriving at the Kyrgyzstan basecamp and seeing the terrain we had to cover I fully expected the boots to be shredded within a week. 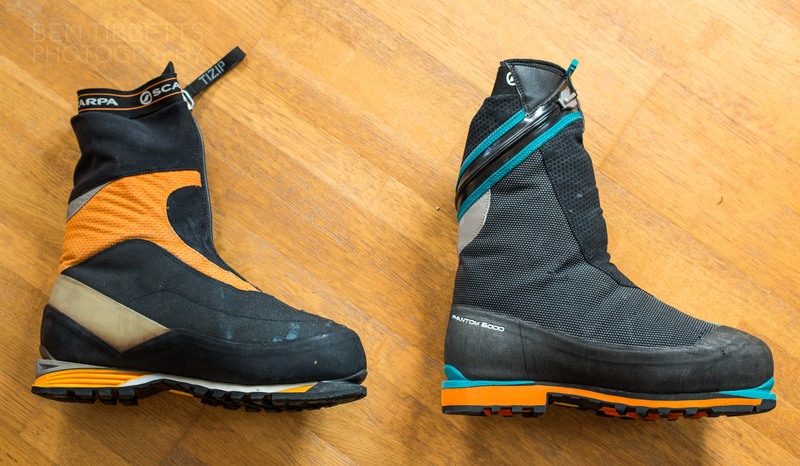 The 6000 boot is deigned for mid/high altitude mountaineering which is primarily snow covered. The range we were in went up to 6800m but unstable weather kept us occupied with the lower peaks. 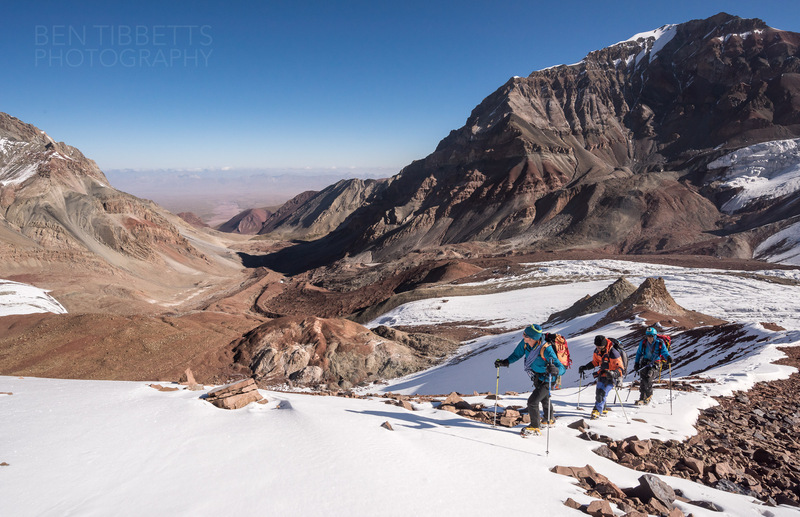 Even then at this latitude there were surprisingly routes up to 5500m that were largely free of snow. What is curious however is that when I weighed the new and current boots they seem to be nearly identical at 1100g. (According to Scarpa the new one should be lighter, so maybe the production version will be trimmed further). So with all these lighter materials how do they come out at the same weight? It seems that the weight saving has been invested in a slightly thicker insulation. Feeling around with the fingers on both the outer and inner boot suggests this. Also a thin layer of inner lining material has been added to the foam, which on the previous version was bare sticky grey stuff from below the cuff. 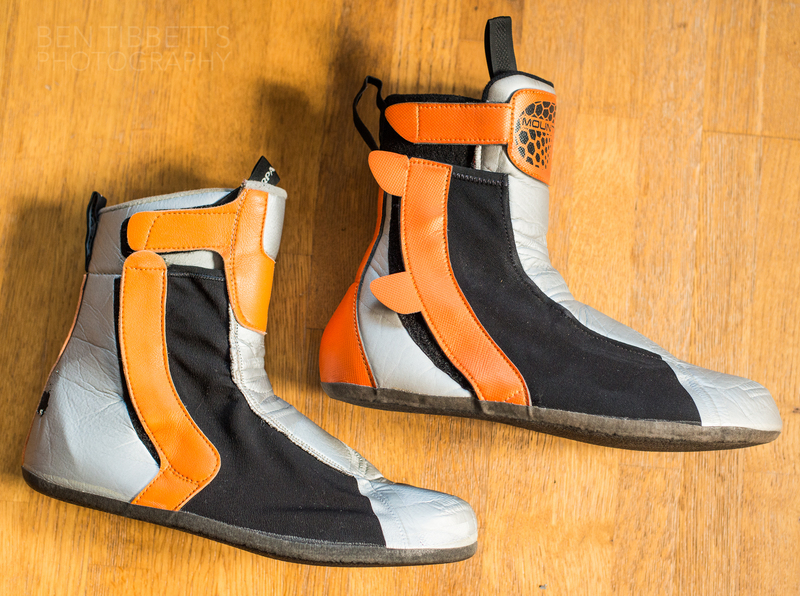 Other than that things like the lacing system haven’t changed much. The crampon welts have changed colour, but design is similar to previously and should work with a similar range of crampons. All in all I was impressed. I expected them to fall apart with all the sharp shredding rocks, especially the soft patch of sole. They held up well and don’t show much wear despite very light construction. 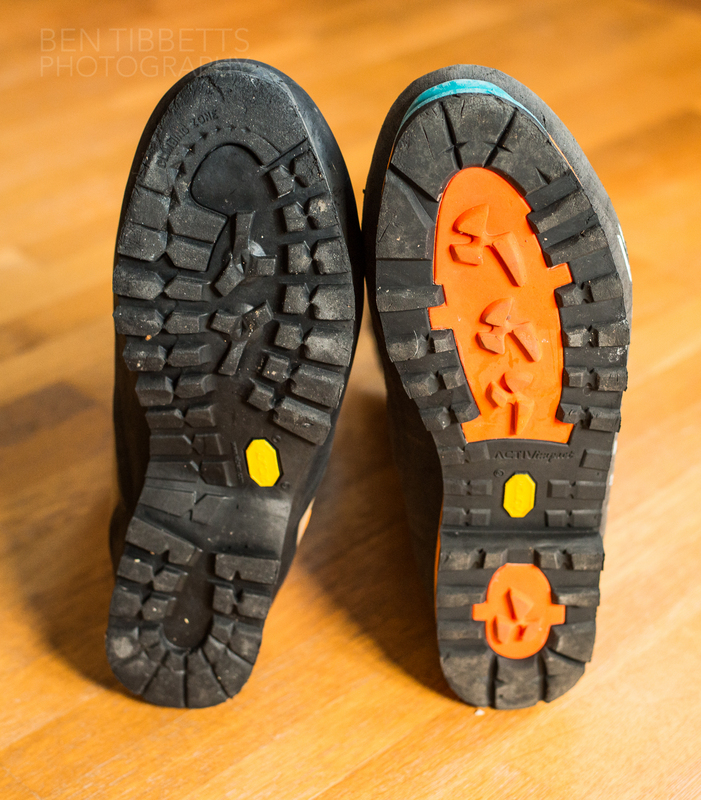 Most importantly they kept my feet warm, and the removable inner boot let me dry the inner in my bag at night. Walking through lots of streams I never got any ingress of water through seams or zip etc. I haven’t yet done any harder technical climbing in them as conditions have been poor this autumn in Chamonix. As with their predecessor, for a double boot, they feel very precise. 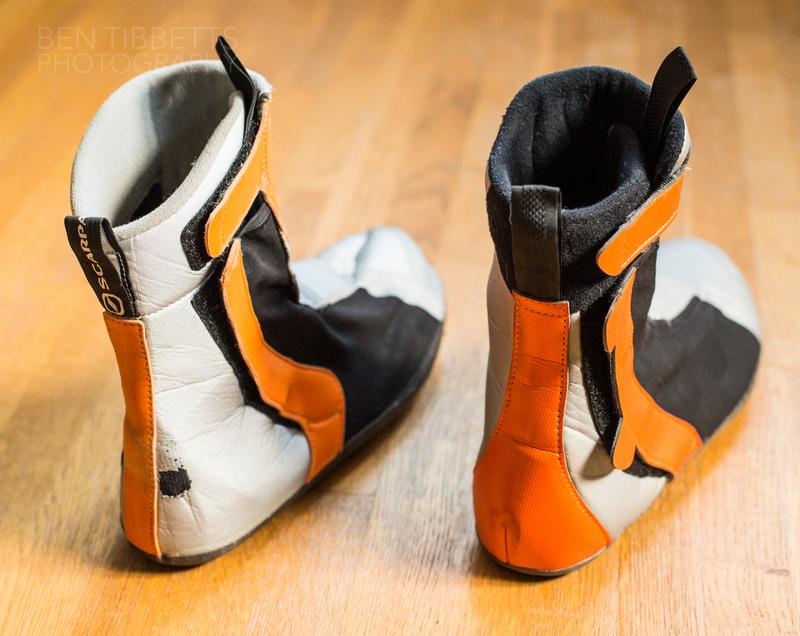 The new version feels more flexible at the ankle due to lighter outer fabrics and zip construction and I think they will be great for technical mixed climbing, but don’t expect much rest from calf burning snow slopes! I also think it is slightly better insulated and warmer than the previous version though may be a little less durable. I get cold feet quite easily and will use them for Autumn, winter and spring climbing in the Alps.. when of course I don’t have ski boots on! I’m off to the Antarctic in December for a couple of months and though I have an older pair of 8000s for deep south work I will see how these feel in the deep freeze.